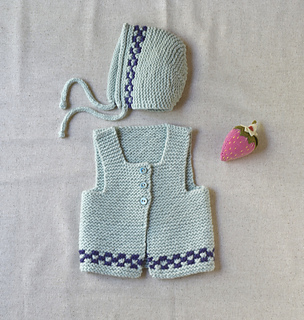 Lille En (meaning “Little One” in Danish) is a squishy treat of a baby set that any new mother would cherish. 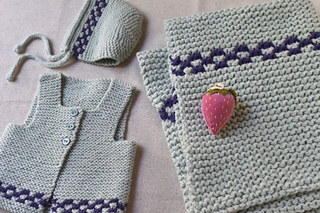 The set is done completely in the bounciest garter stitch with a simple Garter Check Pattern that could also be done in even simpler garter stripes. 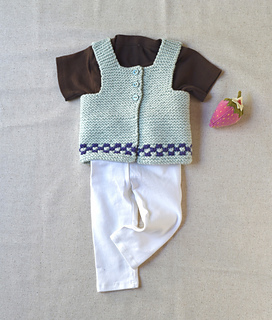 The Lille En Vest is the perfect layering piece for chilly days and the matching bonnet is so sweet. Who can resist? The Lille En Blanket is worked holding two strands of Home Worsted Weight yarn together creating a super bulky and extra-squishy baby blanket that knits up lickety-split! 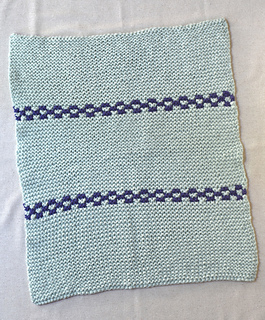 The Lille En Blanket is available as a free pattern on the Barrett Wool Co. Journal! It is also included in this pattern for convenience. Yarn: Barrett Wool Co. Home Worsted Weight (100% American Wool; 230 yards or 210 meters/100 grams), 2 skeins Snowy Pine (Main Color) and 1 skein Wood Violet (Contrast Color), to be held doubled throughout. 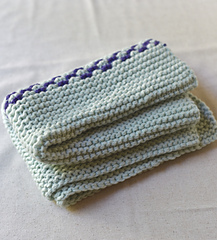 Gauge: 2 stitches and 2 ¾ ridges per inch (2.5 cm) in garter stitch with yarn held doubled. Finished bonnet measurements: 11 (13, 14 ½, 16) inch from tip to tip of front brim. Needles: US size 7 or 4.5mm needles, 24-inch circular to work back and forth, a set of 4 double-pointed needles OR a long circular to use for magic loop in the same size. Finished sizes: 16 (20, 22, 24) inch chest circumference. Needles: US size 7 or 4.5mm needles, 24-inch circular or longer to work back and forth. Spare double-pointed needle of same size.